Bernie Ecclestone's views on women in Formula 1 could stop female drivers being given a chance in the sport, says British racing driver Alice Powell. F1 boss Ecclestone said on Tuesday he thought women would "not physically be able to drive a F1 car quickly", adding they "wouldn't be taken seriously". But 23-year-old Powell, who came close to racing with Caterham in 2014, is confident female drivers can compete. "Someone definitely needs to prove him wrong," she told BBC Sport. "Racing drivers are racing drivers and we know what the expectations are when we go into the sport. "Bernie's views aren't ever going to change unless a female does make it while he is still in charge. I would like that to be me but I will stand by anyone who does do it." Powell says Susie Wolff, who took part in four practice sessions for Williams at grands prix over the 2014 and 2015 seasons, did a "good job" of helping pique interest among women. 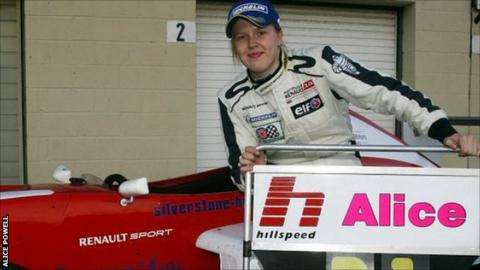 The Scot was the first woman to take part in a grand prix weekend for more than 20 years. But making it on to the starting grid is not easy, with only 22 of the world's best drivers lining up for the Chinese Grand Prix in Shanghai last weekend out of the thousands who take up motorsport and hold F1 as their ultimate goal. Chipping Norton-based Powell, the first woman to score points in the GP3 Series, is an ambassador of Wolff's Dare To Be Different initiative and has met girls as young as seven who harbour dreams of racing. "You should want to be encouraging females, because they do want to get into F1," added Powell, who raced in the MRF Challenge Formula 2000 Championship last season. "I'm sure it will happen, but these comments from Bernie don't help and they could put off sponsors when a quick female does come along." American Danica Patrick is the only women to win in an IndyCar Series race. She raced in Formula Ford in the UK as a teenager but says she "didn't feel like everyone" wanted her to be be successful. Talking to BBC Sport earlier this year, the 34-year-old said she was confident that when a women does next race in F1, they will be there on talent alone. "I don't think you can make it to Formula 1 if you're not somewhat good," she added. "You have to have talent to be able to drive the car."